Gay and lesbian divers from around the world will meet up at this beautiful reef-friendly resort on remote southeastern Sulawesi, Indonesia. 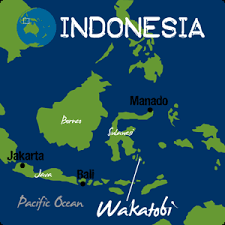 Your trip begins on magical Bali with a private charter flight to Wakatobi Resort. The authentic typical architecture of the bungalows surprises with Western comforts including air conditioning and LAN ports with internet access. All meals are included and the Balinese-trained chefs are world-class. Enjoy unlimited outstanding shore diving on the house reef and two boat dives a day. Indonesia is the center of marine biodiversity, and the protected reefs surrounding Wakatobi are incredibly healthy, with comfortable water around 80 F and excellent visibility. Summer is the peak season for diving here. This is your opportunity to see and photograph lionfish, pygmy seahorses, ribbon eels and other marine life unique to the Indo-Pacific region. Don’t book flights without first consulting the trip leader. Most likely you will book round trip to Bali through Hong Kong, Taiwan, Korea, Japan, China or Singapore. The charter from Bali to Wakatobi, while priced as an option, is the only way to reasonably get to the resort. Charter flight return to Bali will be afternoon, so do not book return international flight until later in the evening. All divers on this trip should be comfortable diving in variable conditions and have good buoyancy skills. Divers are required to carry valid, in-force dive accident insurance, such as Divers' Alert Network (DAN).